Telltale's character drama is as strong as ever, but Clementine's boldest dialogue options end up making her more capable than the adults around her. Spoiler warning: this review contains light spoilers for the first two episodes of The Walking Dead Season Two. All references to specific events in episode three are kept vague to avoid spoiling the story. Clementine is no longer a child. There's a moment near the end of In Harm's Way, the third episode of The Walking Dead season two , that removes all doubt: Clementine is smarter, more capable, and more reliable than nearly any of the adults around her. "Why does it always have to be me?" Clementine asks, with the tired resignation of an Indiana Jones or John McClane stepping up to do the action hero thing one more time. She stops just short of breaking the fourth wall and mugging to the camera. This episode of Clementine's story left me thinking about two things: the increasingly graphic violence Telltale is willing to inflict upon its characters, and the challenge of balancing player empowerment with a character who is rarely empowered. In Harm's Way opens with Clementine's group of survivors imprisoned by Bill Carver, who showed up at the end of episode two to bring his wandering flock back to the herd. Michael Madsen's menacing voice performance sells Carver as the crazy villain who firmly believes he is always in the right, even when he kills or maims for no reason. He's a little too over the top, especially when his threats devolve into angrily quoting bible verses, but the caricature serves its purpose. I'm attached to these characters, and I'm genuinely afraid Carver will kill any one of them. Eventually, he does. Surviving under Carver's thumb sets up an unnerving structure for the episode. It feels like any dialogue option, any decision, may incur his wrath. At one point, I make a decision that causes Carver to kill. I feel terrible about it, replaying the choice in my head, wondering if I could've saved them. But I've played enough of Telltale's adventures now to get how the scene works, and to comfort myself with the knowledge that this particular death was almost certainly a predetermined plot point. In a weird way, episode three makes me feel helpless as a player while making Clementine feel far more capable than any 11-year-old should realistically be. The Walking Dead always shoves its cast headlong into tragedy, but this is the first instance that its characters have truly been prisoners. It creates a weird dissonance. In previous episodes, I never chose where Lee or Clementine were going in the world, but I didn't feel like I needed to. I was following the story, unconsciously assuming that they were going wherever they could to survive. The location of an episode never felt limiting. Once imprisoned by Carver, I was frustrated by the game forcing me from place to place without my input. Clementine wanted to escape, and so did I, but I had no control over how I tried to escape. One particular moment stood out: I was abruptly caught skulking around for seemingly no reason. Clementine left the door open, which I wouldn't have done. The transition from exploring to cutscene was so jarring, I actually thought I'd failed the scene in some way: one second I was alone, the next I'd been caught by a character who wasn't there a second before. It felt unfair, like I was the victim of Telltale's game engine—if I'd taken a different path, maybe my capture would've made sense. That scene aside, the more I played, the more I felt like Telltale knew exactly how it was using this limitation. Being a prisoner is not fun. Prisoners do not get to choose where they go and what they do. Living in fear of Carver adds an uncomfortable uncertainty to every choice—a reminder that my attempts to escape might fail, and they might have severe consequences. 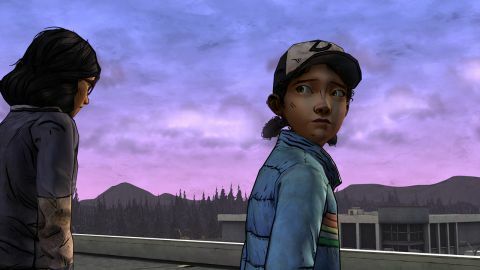 Why, then, does the 11-year-old Clementine feel so much stronger than nearly all of the characters around her? In Harm's Way mostly abandons the dialogue options Clem had in season two's first episode , which allowed her to act innocent to manipulate adults. In episode three, everyone knows she's tough, and the rest of the characters sheepishly give Clementine the most dangerous responsibilities while they sit around freaking out. It's ridiculous, and reminds me that I'm an adult controlling a child in a video game. When Clementine sighs "Why does it always have to be me?" it's just too on-the-nose—it has to be me because I'm the one playing the game, and it wouldn't be much of a game if I sat around doing nothing. But that's not the only reason. Clementine feels so strong and confident because that's how I play her. Telltale has written adult-like dialogue options for Clementine, choices that make her less believable as a young character. Maybe this is part of her coming-of-age growth, but it loses some of the nuance of Clementine's interactions from earlier in the season. I realize that if I chose different options—if I blamed someone instead of taking responsibility, or stayed silent instead of speaking up, my Clementine may be very different. But she'd still be the 11-year-old girl that the adults all turn to for help. Most of the characters mope around helplessly, or bluster into getting themselves caught. Without Clementine, they'd all be dead. Episode three's setting may be the most constraining of the season so far, but it does introduce a couple new characters (and survivors from season one DLC 400 Days) I want to see more of. This is also as violent as Telltale has ever been, and it completely sells Carver's cruelty and the brutality of this post-apocalyptic world. In episode one, I thought Clementine's suturing scene was egregious, played for shock value. Here, violence is used to convey the emotions of the characters and the shades of morality in The Walking Dead. Unfortunately, the environmental limitations and Clementine's maturity pull me out of this episode more than I'd like. Episode two is still the strongest of the season so far, but In Harm's Way does pull off a repeat trick. It tells a 90 minute story that stands well on its own, while ending with a violent cliffhanger to tease what's coming next. I'm left wondering, again, how dark this story can get.